a Tomb Raider and Lara Croft Wiki project. Note: For all articles, visit the Article Overview. 2018/11/01: After the first Kickstarter campaign failed to achieve its goal to finance Tomb Raider: The Dark Angel, Peter Connelly has started a new one with a lower financing goal. 2018/10/01: The Kickstarter campaign to finance Tomb Raider: The Dark Angel - a remake symphonic of Peter Connelly's original Tomb Raider soundtracks - has started. The tenth title of the series, Rise of the Tomb Raider, was release on 10 November 2015 on Xbox One and Xbox 360 (13 November in Europe). The PC version was released on 28 January 2016. — After the traumatising events of the last "Tomb Raider", Lara Croft has to deal with accepting her fate as an adventurer while searching for a powerful artefact - promising eternal life - hidden the lost city of Kitezh. The Rise of the Tomb Raider: 20 Year Celebration Edition was released on 11 October 2016. This is the first version of Rise of the Tomb Raider available for the PlayStation 4 and it includes all previous DLC as well as many new features like a new playable level in the Croft Manor called Blood Ties. In it, Lara has to prove that she is the rightful heir to the manor. Also, includes Blood Ties: Lara's Nightmare, where a horde of undead is trying to take over the manor. Lara Croft GO is the second game made exclusively for modern Smartphones and Tablet PCs that was published on 27 August 2015. This turn based adventure sends Lara into an ancient temple hidden in the jungle. Lara Croft GO includes deadly traps and fearsome enemies await her. A further 26 levels were released on 26 November 2015. The Tomb Raider Universe has a lot more to offer besides the Tomb Raider Games. In December 1997 Lara Croft had her first appearance as comic hero, in a Tomb Raider/Witchblade Crossover. At the end of 2000 a Level Editor was released along with the game Tomb Raider Chronicles. It became a big hit with the fans and is still in use today with over 2000 Custom Levels available for download. In 2001 the first movie with Angelina Jolie as Lara Croft hit cinemas. In December 2003 the first official Tomb Raider Novel followed, expanding the already existing list of Tomb Raider Books. 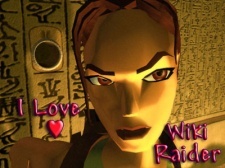 A list of English Tomb Raider Websites. A list of Tomb Raider Websites in other languages. A list of Tomb Raider Forums. For past events please check out Community Events. Registration is closed due to spam attacks. If you contact us, we will help you to register an account. 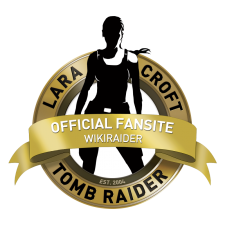 WikiRaider is always looking for dedicated Tomb Raider fans, who like to work on this project, helping us to gather every piece of information about Lara Croft and Tomb Raider. As you may see, there are still many gaps to fill. That's only natural as the Tomb Raider multiverse is huge, and it is almost impossible to know everything. To help you can either create missing articles (please make sure it does not exist under another name), expand stubs (very short articles) or just browse through the wiki and edit/add as you go along. In the help section you can find a number of open tasks under "For Editing". Normally a Wiki is designed so that everybody can add/edit/delete articles, unfortunately a huge number of spammers forced us to lock it down and only allow registered users to edit. If you have any questions, comments, suggestions you can post in the Support-Forum. Please read the Help File (which can also be found linked in the navigation menu on the left) before you start editing. Registered users can set any of these as their default skin on their Preferences Page. Please contact jana@tombraidergirl.com with your proposal. We are also looking for partners who are interested in creating their own wiki in another language and would like to connect the projects. wikiraider is a participant of the Crystal Dynamics Official Fansite Program. This page was last modified on 8 December 2011, at 19:09.